FG recalls 2.4 million bottles of codeine-containing cough syrup – Royal Times of Nigeria. 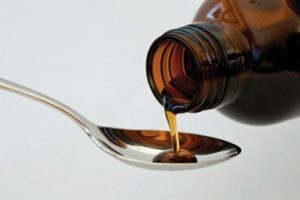 THE Federal Government weekend said it directed the recall of 2,405,724 million bottles of codeine-containing cough syrup from the user market. Minister of Health, Prof. Isaac Adewole, disclosed this in Abuja while receiving the final report of the Stakeholders Committee set up by the Ministry of Health to address the worrisome menace. He said the move was to further demonstrate government’s resolve to stem the abuse of the drug and other substances in the country. According to him, the bottles were recalled after an audit trail of the substance was carried out by National Agency for Food and Drug Administration and Control (NAFDAC). Adewole said the audit trail and subsequent recall of the substance was part of the recommendations submitted by the 22-man committee drafted from a broad spectrum of the health sector. The Minister disclosed that the committee, chaired by the NAFDAC Director-General, NAFDAC, Prof. Christianah Adeyeye, had the mandate to collaborate with relevant agencies as part of the pharmacovigilance efforts of the government geared towards an active monitoring of drug distribution channels with a view to sanitising the system.